The latest website to come out of our shop was an E-commerce site for a brand new company based in Holland, Michigan. Tulip City Alpaca Fashions offers a line of premium Alpaca fiber products including the fabulous Altera Socks. When planning the components of this website, it was important for the purchasing process to be strait forward and easy. RVWS works primarily with WordPress these days and for an E-commerce site, the plugin WooCommerce offers the most flexibility, features and endless add-ons to completely customize the shopping experience. 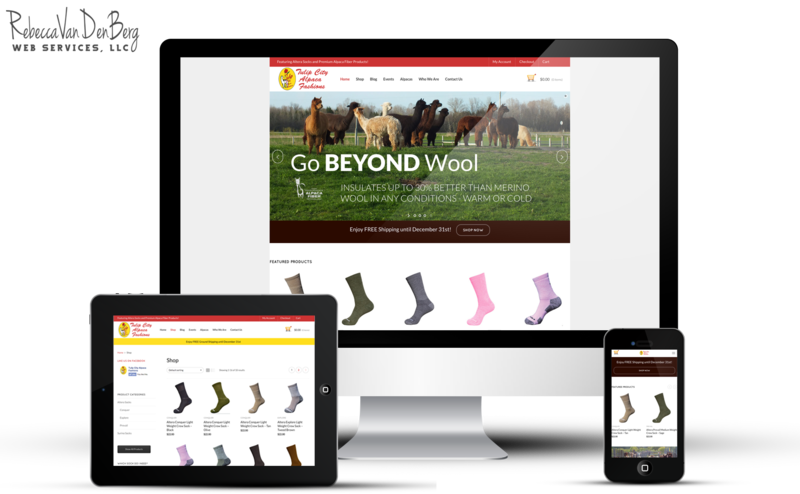 Two special add-ons that we worked with on this project was integrating the process of printing shipping labels, invoices & packing slips all from within the order screen of WordPress and integrating a powerful inventory system as Tulip City Alpaca’s sell products at trade shows and at their farm store. The partners at Tulip City have done a great job of dividing and conquering the duties to make the venture successful. We set-up multiple users in WordPress so they can have one person responsible for creating blog posts & newsletters as well as responding to customer comments; while another person focuses on filling, processing and shipping customers’ orders. In addition to creating the online store, they maintain a strong presence on social media which helps to drive traffic to the site. Find them on Facebook. Or better yet, if you want to try out the BEST socks ever, head on over to the online store and pick-up the perfect Christmas gift for your hard-to-buy-for person on your list.